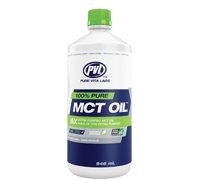 Medium-chain triglycerides (MCTs) occur naturally in small quantities in a variety of foods. In cow's milk, MCTs account for 20% of the total fatty acid composition. They are very hard to find in suitable quantities in foods. To get pure MCTs, they are prepared from coconut oil (a source of MCTs) and are then fractionated or hydrolyzed (enzymatically broken down from “long chains” of fat into “medium chains” of healthy fats). Regular fats are long-chain triglycerides (LCTs) which are C-16 to C-20, or 16 to 20 carbon units long, a measurement of the length of the fatty acid chain. MCT MAXX™ contains up to 60% more C-8 than MCT oils on the market, making MCT MAXX™ the purest MCT oil you can use. MCTs are burned rapidly in the liver, and some of the energy is released as body heat in a process known as thermogenesis. The thermogenic effect is probably the most important reason why MCTs do not get stored as body fat. Instead, excess calories from MCTs are converted to body heat, increasing your metabolism, and this means you burn more calories per hour.